We often have wonderful plans all mapped out in our brains. Sometimes they involve obtaining notoriety for impressive actions achieved with our incredible skills and talent. On the other hand, our heroic brainstorm might involve ourselves moving large formidable objects that typically only experts would dare attempt. Far too many projects and schemes are too quickly acted upon and the end result is an abysmal failure or a botched endeavor that must be replanned and undertaken later on. We must learn from these mistakes to become a much wiser person as a consequence. While driving to Lynden on H Street last week I came across a detour sign, red flares and a sheriff's car blocking the road. 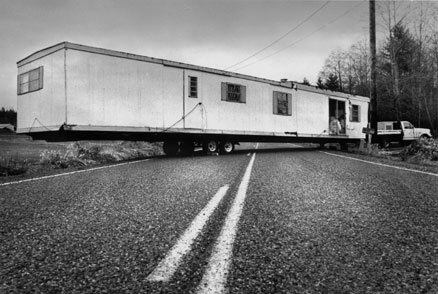 Behind these apocalyptic warnings was a large mobile home that was broken down obstructing the roadway. The new owners were attempting to save money and bring the monolithic trailer home by themselves Their truck broke down, then a neighbor tried to help and they got stuck. The sheriff deputy had to call a towing company to bring their super colossal rig that also carried a hefty towing bill. The lesson: too often a penny saved is a dollar spent later on.